Thanks again for all your kindness. If you can get me “PRED FORTE “eye drops, Suspension(prednisolone acetate) from Allergan. I have one k9 that has Pannus in the right eye and she needs this meds permanently and I am running out of it time and time again. We cannot get it locally, so have to ship it in. Maybe you are more lucky than me to get some, I will be most happy. 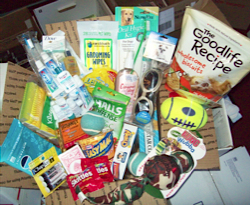 We were able to mail them along with treats for the dogs and handlers. Here is the note we received from Andre. Happy news, yesterday we received the 2 boxes you sent. We were so happy first for the dog meds and second for the treats. Of course the Marshmallows did not left my table. Thank you so match for the letter from all the kids, it really brings tears to eyes. I can tell you sometimes we ask why are we here, but when we received cards like that, we know there is a purpose for it all . The guys all want to say many thanks for what you and your staff are doing and we took notice of all your effort and projects. God bless you all. I have a new dog in my group a springer spaniel will send you picks an awesome dog …like a child wants to play all day. Thank you to WMMR (#1 rock station in Philly) and their Cheerleaders for, again this year, raising money for Project:Troop Dogs at their huge annual MMR-B-Q event. And they keep giving…John Meehan and the Cheerleaders matched the amount that was raised in the dunk tank. Fantastic!!! Special thanks goes out to Jen Noval, who made this all possible for Project:Troop Dogs. 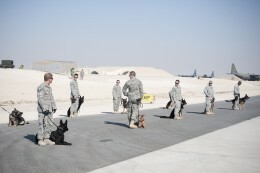 Their efforts will help many MWD teams. Thank You!!!! Hello,My brother is currently deployed in Iraq for the US Navy. He’s noticed a few dogs on base that are without any enrichment items, as well as some street dogs that are in very bad shape. Would it be possible to have a care packaged sent to the base for these dogs? At least for the dogs on base? UPDATE: See the thank you letter and pictures sent by Hollie’s brother on ‘Troop Letters’ page. “I spoke with a buddy of mine in Afghanistan today and he was asking for some “stuff” for his pup — it’s starting to get colder at night. His name is MA1 Dan F. (out of Norfolk, VA) and his partner is MWD “Aatom” (he’s an awesome Mal). He’s looking for size 12 heavy socks and some crossword puzzles (for Dan, not Aatom – ha ha). For “Aatom” – he’d like to get some blankets. He told me that “Aatom” digs into his blanket bed and ends up covering himself up in them. He’d like a couple more and some smaller ones to take out on their missions. He also likes Raman noodles, twizlers and small treats to take out with them. …. There’s another team with him, MA3 Sheld (I don’t know his first name) and his MWD “Nico” (Black GS) – from Sigonella, Italy. These teams are in great need, here is another request for Dan and the TEDD teams. their very, very difficult deployment safely – Thank God. soldiers, airmen and marines would be greatly appreciated. States and our fellow Americans when you’re deployed. You are currently browsing the archives for the Status Updates category.